The updates to the Common Rule known the 2018 Final Rule are now, as of January 21, 2019, in effect. The Final Rule webpage details the many changes embedded in the updated Common Rule. The IRB has updated other sections on its website to reflect the revised regulations. The Children's Hospital of Philadelphia's (CHOP) IRB is organized and operates in compliance with the Department of Health and Human Services regulations, as described in 45 CFR 46, for federally funded research and FDA regulations, as described in 21 CFR Parts 50 and 56, for FDA regulated research. In addition, the IRB operates in compliance with portions of the HIPAA Privacy Rule that apply to research, as described in 45 CFR Parts 160 and 164. CHOP holds a Federalwide Assurance (FWA00000459). The CHOP IRB complies with the registration requirements for both OHRP and the FDA. CHOP’s Human Research Protections Program has received full Accreditation from the Association for the Accreditation of Human Research Protections Programs (AAHRPP). The Committees for the Protection of Human Subjects is the official name of the IRB committees that are appointed by and serve under the auspices of the CHOP Executive Committee of the Medical Staff. The CHOP IRB reports jointly to the president of the medical staff and to Bryan Wolf MD, PhD, who is the institutional official responsible for human research protections. At present, there are two CHOP IRBs. IRB A has 11 members and 11 alternates and meets twice a month; the Executive IRB has 5 members (also members or alternates for IRB A) and meets on an as needed basis. Committee membership is consistent with the requirements of 45 CFR 46.107 and FDA 21 CFR 56.107 and CHOP medical staff bylaws. The CHOP Research Institute Administrative manual includes Appendix J - Human Subjects Protection Committees - Institutional Review Board Charter, which fully describes the IRBs organization and structure (available only on the CHOP intranet). The membership of CHOP's IRBs complies with all federal regulatory requirements. The IRB works closely with related committees, such as Radiation Safety, Institutional Animal Care and Use Committee (IACUC), the Institutional Biosafety Committee and the Clinical and Translational Research Center (CTSC), to ensure that the requirements of those groups are addressed before final approval of a project is provided. 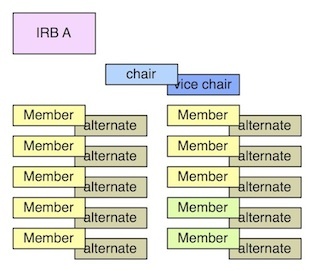 The CHOP IRB is composed of 11 individuals each of whom is paired with an alternate member. (Figure) One member of the pair is expected to attend each meeting, which take place on the first and third Wednesdays of the month. A statistician serves as a alternate and may substitute for any scientific member. The Director and the Assistant Director, IRB Analyst IIs, and IRB Analyst IIIs are also alternate members. This enables them to be designated by the chair to review and approve minor changes to research and continuing reviews of minimal risk research. The IRB Office provides administrative and technical support as well as regulatory expertise for the committees and serves as the primary contact for investigators. See Contact Us to get in touch with the IRB Office staff. Streamlining Ethical Review This last reference should be of assistance to investigators whose IRBs do not take advantage of the flexibility permitted within the regulations. Tips for finding information on this website. Each IRB at CHOP includes voting members, including a chair and vice chairs, in addition to a variable number of alternate members. Members are selected for their willingness to serve, expertise and familiarity with research design and procedures. Members include faculty from a wide variety of clinical disciplines and specialties to ensure adequate expertise. The committees also include legal advisors, nurses, pharmacists and others to provide needed expertise, and community members and non-scientists to represent the viewpoint of the general community and lay audience. A Federal Wide Assurance (FWA) must be submitted to the Office of Human Research Protections (OHRP) in order for an IRB to review research that is federally funded. An FWA assures that an institution will comply with the federal research regulations (the Common Rule), national and international ethical principles, and federal, state and local laws on the involvement of human subjects in research. The safety and well-being of patients and volunteers participating in research studies is of utmost importance at The Children's Hospital of Philadelphia. Using human subjects in research is a therefore a privilege requiring an absolute commitment to complying with the ethical standards and regulations that guide research involving human subjects. Investigators and members of the investigative team must complete initial and ongoing training to ensure that they understand the federal regulations and the ethical requirements associated with human subjects research.